(Phys.org) —In the growing area of flexible, transparent electronic devices, silicon has not played much of a role. 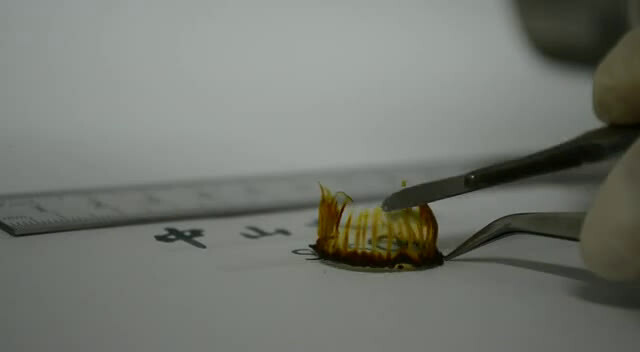 Instead, materials such as indium tin oxide, carbon nanotubes, and others are often used to make bendable electronics. Now in a new study, researchers have synthesized silicon nanowires and woven them into a paper that outperforms many other paper-like materials in terms of transparency and flexibility. Since today's integrated circuit technology is designed for silicon (in bulk form), silicon nanowires would be much more compatible with these existing technologies than other materials, an advantage that could potentially rejuvenate research into silicon-based flexible electronics. The researchers, Chunlei Pang, Hao Cui, Guowei Yang, and Chengxin Wang, at Sun Yat-sen (Zhongshan) University in Guangzhou, China, have published their study on the flexible, transparent, and self-standing silicon nanowires paper (FTS-SiNWsP) in a recent issue of Nano Letters. "We achieved the synthesis of flexible transparent and free-standing silicon nanowires paper, which may be a new part of the modern semiconductor industry," Wang told Phys.org. "The silicon paper shows more superiority than other inorganic semiconductor materials due to the advantage of being compatible with today's integrated circuit technology for bulk silicon, and may be expected to meet emerging technological demands such as components of transparent electrical batteries, roll-up displays, wearable devices, and so on." As the researchers explain, bulk silicon is brittle at room temperature and only becomes ductile close to its melting temperature of about 1400 °C. In contrast, nanoscale silicon possesses a very large straining ability that enables flexibility at room temperature. However, weaving silicon nanowires into a paper-like material has been challenging because it requires achieving a unique interlocking alignment using controlled, catalyst-free growth methods. Here, the researchers developed a simple method to synthesize silicon nanowires and assemble them into the desired interlocking alignment using a vertical high-frequency induction furnace. SiO powder and Ar gas (serving as a carrier gas) get blown into the furnace where they are quickly heated to about 1600 °C and kept there for 1 hour. The heat causes the SiO powder to decompose into SiO2 vapor and Si particles, both of which are transported by the Ar gas to a low-temperature zone where they stratify under gravity action due to their different molecular weights. As more SiO2 and Si are transported to their locations, they nucleate and grow. While the SiO2 deposits form a powder sample, the Si particles form nanowires with diameters of about 10 nm that grow in the direction of the gas flow. As the Si nanowires grow, they spontaneously interlock with each other to form a free-standing membrane material. Scanning electron microscope images show a highly porous, woven structure, whose pores can potentially be filled with other functional materials for novel applications. Tests also showed that the FTS-SiNWsP material had very good optical transmittance and could bend repeatedly without cracking. To demonstrate how these woven silicon nanowires can be used to create high-performance battery electrodes, the researchers grew graphene on the outside of the silicon nanowires in a core-shell design. The graphene also filled the gaps of the woven silicon nanowire material, completely encasing the material. After fabricating coin-cell Li-ion batteries using a FTS-SiNWsP@graphene film as the anode and Li as the cathode, the researchers showed that these batteries have very good performance, performing close to their theoretical capacity and maintaining a capacity of more than 1000 mAh/g after 100 cycles. The FTS-SiNWsP material has the potential for many applications in addition to battery electrodes, such as flexible solar cells, wearable computers, paper displays, and supercapacitors. In the future, the researchers plan to build on this synthesis method to develop silicon nanowire paper materials to meet these emerging technological demands. "Next, we plan to carry out the application research of the silicon paper material in solar cells," Wang said. Might be tough to scale up a process like that to support economical production. It's slow, and it uses ferocious amounts of energy. I hasten to add, basic research like this is always valuable; it's one more set of data points to guide future development decisions for the industry.